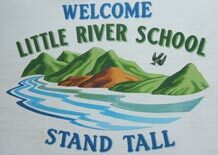 Little River School is situated just off the Christchurch-Akaroa Highway, approximately 45 minutes drive from Christchurch City. It is a co-educational state, full primary school (Years 1-8). The school roll currently stands at 100 pupils (March 2019). With Little River School drawing from such a widespread area, many of the children come on one of two bus routes. The school attracts its pupils from geographically isolated valleys within a radius of 30 minutes travelling of Little River including Birdling’s Flat, Te Oka, Okuti Valley, Cooptown, Western Valley and Puaha Valley. Nearly 50% of the children travel daily by school bus. These areas offer small/large farm, lifestyle and township living opportunities in a clean and healthy country environment. Staff consist of the Principal with .1 (one day) teaching responsibility and a teacher for 4 days per week (Year 8) in Kahikatea; two teachers sharing in Totara (Year 6/7); one full-time teacher in Matai (Years 4/5); a full time teacher (job shared) in Ti Kouka (Years 2/3,) and a fixed-term teacher in Kanuka (Year 0/1). Teacher Aides are employed to help address classroom needs and support the literacy and numeracy programme, as well as Teacher Aides funded by the Ministry to work with special needs children. The school also has an office manager. Parents are involved with assisting in sports, Christian education, classroom programmes, grounds maintenance, transporting children, camps, trips and the arts. The school has continued to develop strong links with the community. Maintaining a positive school culture is seen to be very important so that all children will meet with success in a safe, physical and emotional environment. We rely on a willing group of parents who make up the Support Group (an Incorporated Society) to help organise fundraising in order to donate everyday equipment etc. The Support Group is a very active group whom we have come to rely on for resources needed to deliver the curriculum, subsidising camp and helping to maintain our behaviour management programme by funding the Cool Card box. The Country Bumpkin Pumpkin Festival (usually held around Anzac Day) is our major fundraiser each year. It is a great day and a chance for the whole community to be involved. As well as its governance role, the Board of Trustees has been active in supporting fundraising. The continuing support of the Board has enabled the school to focus on improving teaching and learning. Staff at Little River School are a dedicated group of professionals who continue to reflect on their practice and aim to enhance the teaching and the learning of students at every opportunity. High expectations in terms of not only academic achievement, but also behaviourally, ensure that high standards are maintained. We have recently become a school with a Restorative Justice focus for our behaviour management, aimed at putting right the wrongs, growing great relationships based on our values and catching children being good, rather than focusing on punishing children for learning mistakes. Respect is our main rule and we believe there is no place for bullying in our school and we will do our best to address issues as soon as they arise. Children are encouraged to notify a friend, senior buddy or a teacher as soon as they feel unsafe so we can help sort out problems. Teachers will often notify parents early on if there is an issue they feel needs addressing. Part of the way we like to work is to have face to face contact with our parents and build a successful partnership with families. Parents can play their part too in talking to the classroom teacher or principal when concerned about any issue. At every assembly, different children are given certificates not only for academic achievement, but also for positive citizenship. Awards at the end of the year are given for academic excellence (one for each year level), sporting excellence and Year 5/6 and 7/8 citizenship cups. All children follow our school rules of respect people, respect property, respect yourself and respect the environment. Teaching and learning has come a long way in NZ over recent years. We are very proud of the way staff embrace changes so that we are right up with all that is new to improve the education for our children. One thing we will not compromise on though, is ensuring that Reading, Writing, and Maths remain at the forefront of all our development as a school. All teachers are expected to teach these subjects every day. Over recent years we have done a lot of work round personalized learning and the application of ICT into the classroom programme, our students have lots of talent in this area. We are also fortunate in that our students are all fit and active. Break times will see most children involved in constructive play activities. There is plenty of opportunity for children to excel in school sports events – triathlon, swimming sports, rugby, netball, soccer, and athletics. Students who do particularly well at these events have the opportunity to go on to compete at the Lincoln Zone sports, or even to the Canterbury Zone sports. As well, there are times when children get to show off their work at various expos and class assemblies. A highlight of the year is always Pet Show in Term 4. Our school motto is “Stand Tall”. We have a vision that all our children will leave Little River School proud and confident of who they are. Confident because they have the academic skills to choose what they want to do, and confident in their relationships with people so they can adjust to any situation. Little River School is a great place to be. We believe the children get an excellent grounding at our school which enables them to meet with success and develop skills needed for life long learning.